It is rare for a person to be completely satisfied with the appearance of his or her smile. While there are many cosmetic flaws that can detract from the beauty of the smile, one of the most common is crooked teeth. A jutted tooth sticks out further than adjacent teeth and can throw off the entire balance of the teeth, giving them a crooked or uneven appearance. Dr. Patrick Seely offers a range of cosmetic dentistry treatments that address aesthetic flaws to help patients achieve their ideal smile. Many of these treatments are effective at improving the appearance of a jutted tooth. Treatments for a jutted tooth allow our Windsor, CA patients to have teeth that look straight, balanced, and beautiful. Porcelain veneers are cosmetic fabrications that fit over the facial surface of the teeth. These thin ceramic shells cover the natural teeth to conceal cosmetic flaws. Many people use porcelain veneers to hide discoloration or minor chips and fractures, but they are just as effective at improving the appearance of misshapen teeth, including a jutted tooth. Prior to applying porcelain veneers, Dr. Seely removes a thin layer of the patient’s tooth enamel. This allows the veneers to sit closely against the teeth and blend in smoothly with any untreated teeth. Porcelain veneers improve the overall appearance of the smile while maintaining the natural appearance of the teeth. When a tooth juts out from the adjacent teeth, it is often a sign of misalignment. The patient may have a jaw that is too small to accommodate the teeth, or the jaw may not be lined up properly. In either case, it can cause a tooth to get pushed out of its proper position and jut out from the rest of the teeth. Invisalign® addresses alignment problems and straightens the teeth without forcing patients to rely on uncomfortable and unattractive metal brackets and wires. 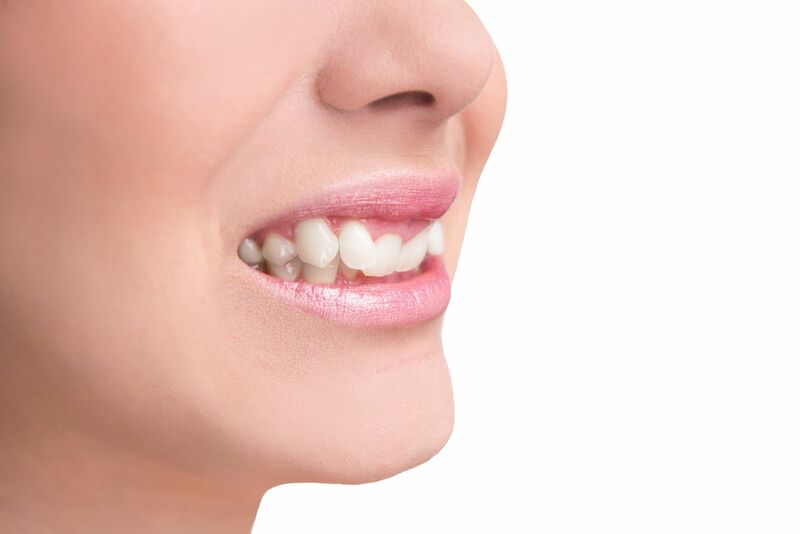 During treatment, a series of clear plastic aligners provides the pressure that is needed to improve the position of the teeth and correct the bite. This is a comfortable, convenient, and discreet alternative to traditional braces. In most cases, a jutted tooth can be treated with porcelain veneers or Invisalign®. However, a jutted tooth can be difficult to clean and is more prone to decay and infection. If the health of the tooth has been compromised, dental crown treatment may be appropriate. During dental crown treatment, any damaged tooth enamel will be removed before placing the crown over the tooth. A dental crown enhances the health, strength, and appearance of a tooth. Dr. Patrick Seely works to ensure that each of his patients enjoys the healthy, beautiful smile they deserve. If you are interested in treating cosmetic flaws to enhance the appearance of your smile, contact us at your earliest convenience.